Underworld: Blood Wars, the fifth and latest installment in the franchise, doesn’t exactly pick up where the previous installment ended, and that’s only part of what’s wrong with this entry in a franchise that is getting long in the tooth. Warning: this review contains massive spoilers. Proceed at your own risk. At the end of Underworld: Awakening, Selene (Kate Beckinsale) was reunited with her daughter, only to discover that Michael had escaped from his cryo tube and was nowhere to be found. As Underword: Blood Wars opens, Selene is on the run, being chased by Lycans who want to know the location of her daughter. Somewhere between these films, Selene sent her daughter, Eve, far, far away to a place Selene does not want to know about, so that if she is captured by a rival vampire coven or by lycans, Eve’s whereabouts will remain unknown. Of course, this still leads the audience to believe that by the end, the family will be reunited once and for all. Unfortunately, Blood Wars wants to try to kill off Selene twice, once as part of a betrayal by coven-leader Semira (Lara Pulver) as a means of siphoning her blood to create an army of super-powered vampires that can resist light, and again by lycan leader Marius (Tobias Menzies) in hope of locating Eve. Selene is resurrected by the Nordic vampire coven, who then manage to do battle and win against Marius’s clan of lycans. Any hopes of a family reunion are eliminated when it is revealed where and how Marius received his powers, yet Selene knows somewhere Eve is still alive. Some may say I’m being a bit harsh on this installment for its convoluted plot and for taking itself all too seriously. Those are only two of the many problems here, not to mention the almost lack of continuity with the previous installment, which would have you believe that this installment would have Selene, Eve, and David (Theo James) on a quest to find Michael before the lycans do. Even with the recap of the prior four films in the prologue of Blood Wars, one must wonder if there is a movie missing here between Awakening and this one. Fans almost have to feel sorry for Scott Speedman, the actor who portrayed Michael in the first two installments, since his character is mentioned but hasn’t been seen in the series since Underworld: Evolution (Speedman can be seen on TNT’s Animal Kingdom). Although one almost expects Beckinsale to reprise her role as Selene (and she does so with ease), it’s surprising the level of talent this fifth installment managed to attract. Both Theo James and Charles Dance return as David and his father, former coven leader Thomas, but we’ve seen them in much better material (James in Divergent, Dance in Game of Thrones). Bradley James (better known as Arthur on BBC’s Merlin) plays Semira’s pet, Varga. Where the movie really falters, though, is in the action sequences (which are often dull and uninspired) and the film’s overall direction and pacing by first-timer Anna Foerster, so much so that this reviewer couldn’t believe how long the 91 minute running time felt. One of Selene’s first lines in the movie after the prologue are “I had lived beyond my time.” That almost sums up Underworld: Blood Wars. Underworld: Blood Wars was captured in 6K resolution using Red Weapon Dragon cameras and completed as a 4K digital intermediate. Sony’s 2160p transfer with HDR is almost reference quality. I say almost because the blacks are so deep that there are moments where shadow detail becomes lost in the very darkest of scenes, and the HDR-enhancements to the color palette mute the colors further than on the 1080p Blu-ray edition, making the resulting image much more monotone in nature. Granted, that may be the intent here by the creative team, but the reduction in shadow detail is a real shame. The other disappointment here is the lack of a 3D Blu-ray disc, despite the film receiving a fairly wide theatrical 3D release (which seems a bit odd, considering Sony’s prior commitments on other UHD/3D releases such as Angry Birds, Ghostbusters: Answer the Call, and most recently, Passengers.). Otherwise, this is a crystal-clear picture with exceptionally fine detail, particularly in skin blemishes and the strands of hair in the fur coats worn by the Nordic coven. The UHD disc benefits from a fairly active Dolby Atmos track, which contains a Dolby TrueHD 7.1 core (the Blu-ray only contains a 5.1 DTS-HD MA track in typical Sony fashion). The Atmos track has a very wide soundstage and a wider dynamic range. Bullets, ninja stars, and other projectiles assault the listener from virtually every possible angle. LFE is also more prevalent, but never overpowering. Dialogue is clear and understandable, directed mostly to the center channel and never gets drowned out by the mix. All of the Special Features can be found on the included 1080p Blu-ray edition. The Evolution of Selene (1080p; 8:09): Selene’s history through the series. Old & New Blood (1080p; 6:15): An examination of Thomas, David, Vidar, and Lena. The Evil Evolved (1080p; 6:07): A look at the more villainous characters Cassius, Semira, Varga, Alexia, and Marius. Building a Blood War (1080p; 12:03): A behind the scenes look at the making of the film, featuring interviews with the cast and crew. 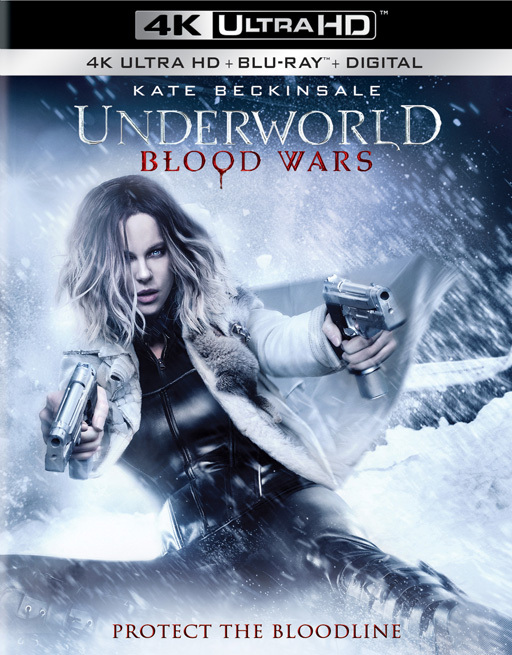 Underworld: Blood Wars Graphic Novel (1080p): As the title indicates, the movie told in graphic novel form, with two pages displayed per screen. However, the text is often too small to be read. Underworld: Blood Wars may me a mess of a movie, but it sure looks and sounds great on UHD. Unfortunately, Sony opted not to include a 3D version of the film, and the special features are barely a step above EPK material. For fans only. Basically the consensus I have been reading elsewhere. I bought yesterday, will save for a wife free night with some cold IPA's. That's funny, because it's my wife that enjoys these films much more than I do! The movie was overly dark IMO, and a limited use of HDR for sure. That being said, I did not feel I was missing detail it was just a dim movie but I watched it in a dark room. Other than that I thought it looked good. I didn't have a shadow detail issue, it was just a dark movie. They also did not use HDR very well IMO, that being said, it was probably intent because the movie looked pretty good. It's the reason I always watch movies in the dark.